As reported by The Wrap, The Catholic League For Religious And Civil Rights has issued a statement denouncing a recent episode of South Park, calling series creators Trey Parker and Matt Stone “cowards” for the way their show tackled the Catholic Church’s history of covering up child molestation. Weirdly, though, the statement from Catholic League head Bill Donohue is less about not wanting South Park to vilify priests and more about wanting South Park’s commentary to be factually accurate. 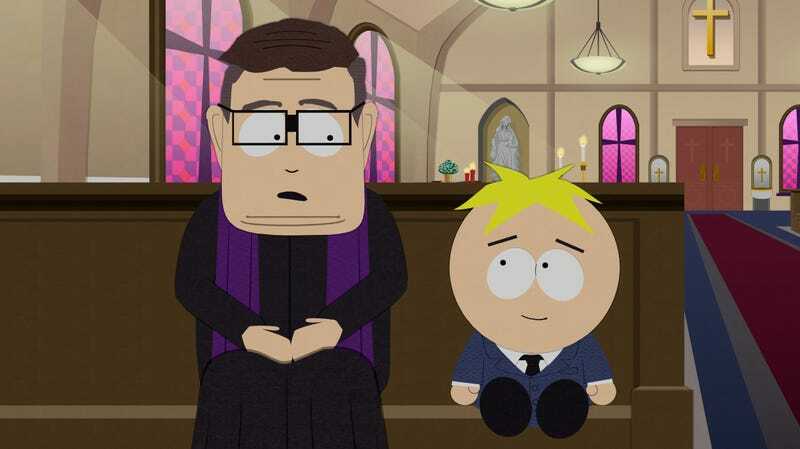 The episode centers around Father Maxi, South Park’s local Catholic priest, and his relationship with the ever-innocent Butters. Everyone in the town assumes that Maxi is molesting Butters, even though he’s not, which prompts the leadership in the Catholic Church to send a clean-up crew that can erase any molestation evidence and quietly ship Maxi off to another church (you know, like in real life). The October 3rd episode of South Park, titled “A Boy and a Priest,” portrayed molesting priests as pedophiles. This is factually inaccurate: Almost all the molesters—eight in 10—have been homosexuals. Therefore, the cartoon-victim characters should have been depicted as adolescents, not kids. In Hollywood, the creators of South Park, Trey Parker and Matt Stone, are seen as courageous. They are really cowards. It takes courage to tell the truth.